WX SAINT brings stylish design, world-class protection and multi-lens versatility to every activity under the sun. Battle-Proven vision protection has never looked so good. Perhaps the most important feature of the new WX Saint is that it offers a level of comfort and good looks not commonly associated with safety glasses. People on the job indoors or out will wear these stylish, lightweight glasses because they want to, not because they have to. Gloss Black Frame and Polarized Smoke Green Lenses give you the perfect formula for tasteful protective eyewear granting safety to your eyes. The Polarized Smoke Green Lenses have maximum glare reduction without distorting colors. These lenses are great for general daytime use. 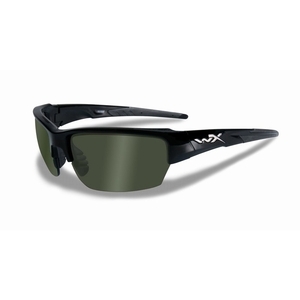 SMOKE GREEN LENSES* Maximum glare reduction without distorting colors. Great for general daytime use. Light transmission: 21%, 17% Polarized.